Have you heard about Zebrating Art before? If “yes” let us know how and where! 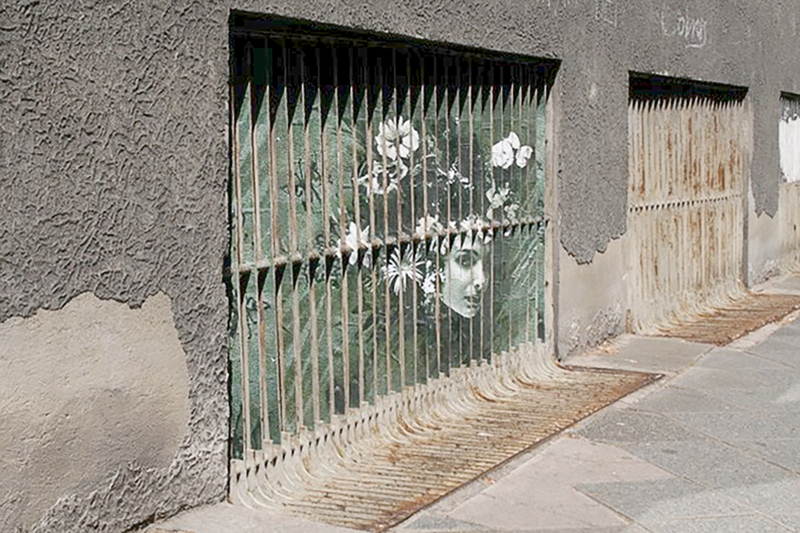 Zebrating Art is a team of two artists who create outdoor illusions painted on the barred-fence located somewhere on the streets. 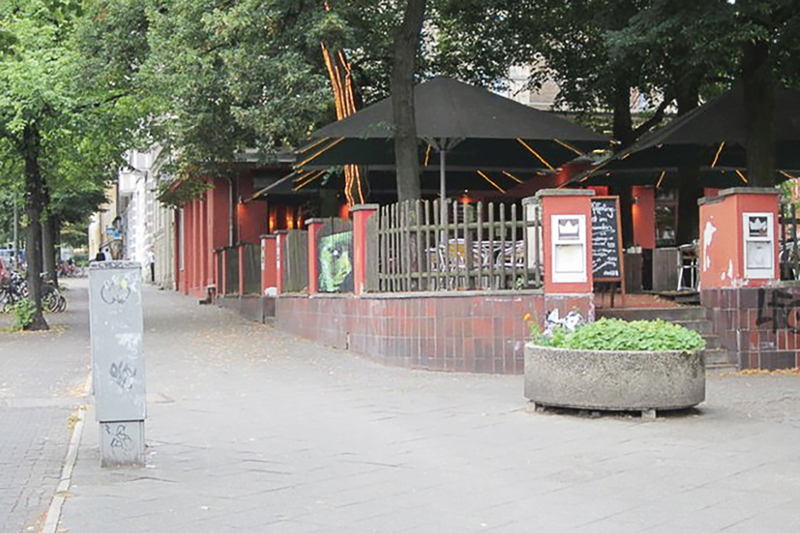 They are from Mannheim, an urban city in the southwest of Germany. The artist name they have chosen: “Zebrating” means literally “making the zebra” and describes the technique they use to split the artwork in stripes, like the stripes of a zebra. 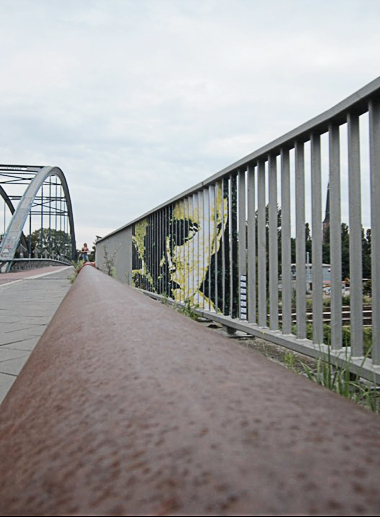 They have been involved in street art for about 5 years, originally starting with stencils. When they’re not “zebrating” they create collages, paintings on canvas, photographs, make stickers… and do some sporty activities outside! To promote their artwork, they use, until now, only a Facebook page. They know about the other communication platforms but the time needed do feed all these websites costs so much time – rather they prefer to spend their time outside of the virtual world… making art or sport! Most of their inspiration are forgotten treasures from old Books and Papers. They love C215(as a street artist), Escher (as a graphic designer), Egon Schiele and Klimt (as painters). With Zebrating art, they create size XL. 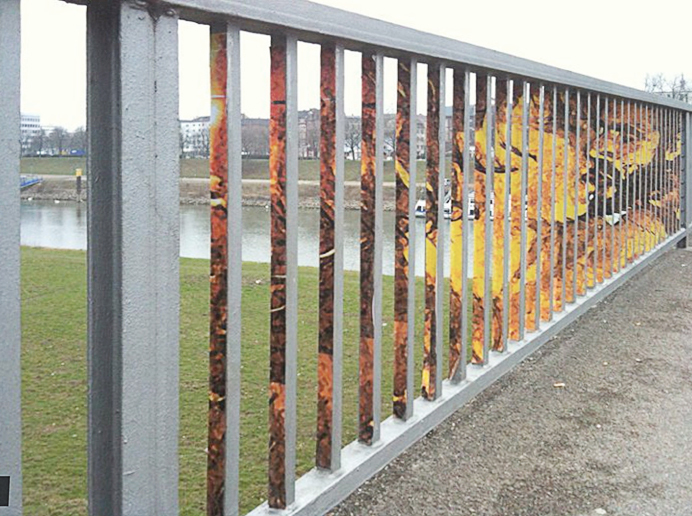 Remember it’s a railing… So most of the time the pieces’ dimensions are about 1×2 meters. Until now, they always work with people, especially faces but as art is a neverending process, they don’t want to go with a predetermined theme. They do zebrating only on railings, lattices or fences, the ideal support! To work, they use tools like: paintbrushes, a meter band, glue, painting colours… And every piece is photographed! How much time do you need to put a work in the street? Any artistic tips you can tell us? The two artists cannot unify us on the colors choice, so: Zebrating 1 says green whereas Zebrating 2 says orange. In terms of music, they love to listen to lounge, reggae and drum’n bass. 3 things that Zebrating crew love in general: Spicy food / Art / Summer thunderstorms. 3 things they hate: Bland food / Intolerance / Pessimism! Any new event coming up to tell us about? © Zebrating Art - Bike and "For more kisses"
“Websites like yours are great! Finally, street artists are like any other artists. Through you, they can come out from their anonymity today and can be supported. Thank You! Je n’avais jamais entendu parler d’eux mais j’aime beaucoup ce qu’ils font!! Oui je suis d’accord ce travail est assez dingue ! J’aimerai en voir en vrai… à Paris ! J’adore ce duo d’artistes…C’est assez fantastique !!! 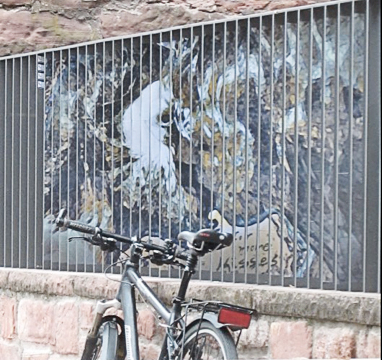 Pouvoir exploiter des graphismes sur des grilles offre de nouvelles perspectives au street art, même si y a surement un gros travail derriere, il ya beaucoup de grilles dans les centres-villes. En plus La grille est un symbol du capitalisme privatisant. Même si je n’ai malheureusement pas vu leur travail “live” lors de ma visite à Berlin !